I'm 21 years old, born in South Korea. I've lived in London all my life and started music when I was 4 years old. I reached grade 8 on piano when I was 12, picked up the violin when I was 6 years old and it became my first study ever since. 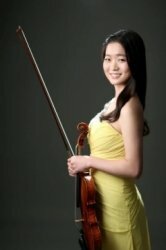 I am an undergraduate at the Royal College of Music studying violin. I have a lot of teaching experience of different ages and levels. Please message for more info! I like to be focused whilst having fun and enjoying the lessons with a positive mindset! JuheeFrom Dillon (5/5): Juhee is very responsive, always on time and a good teacher, my daughter enjoyed all of her sessions. Fully recommend her. JuheeFrom Jeremy (5/5): Tatiana has been enjoying lessons with Juhee and she seems to be making good progress. Juhee has always been on time and has a friendly manner.